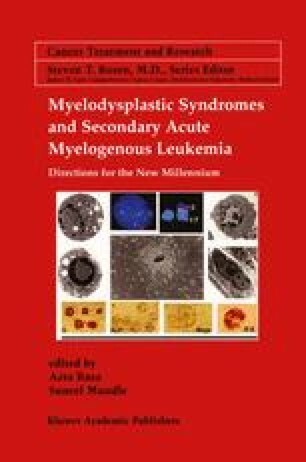 Myelodysplasia (MDS) is a clonal disease, which increases with age, suggesting that multiple steps are required for the evolution of the condition. Approximately 30% of MDS evolve into acute myelogenous leukemia (AML). In this review, we intend to delineate the genetic events, which may drive this sequence and therefore we will focus primarily on cytogenetic abnormalities where the genes have been identified and oncogenes and suppressor genes that have been implicated. In terms of the biological mechanisms, which characterise this process, it is generally thought that the MDS cell has impaired differentiation, and has increased apoptosis. As the disease progresses in addition, the cells have increased proliferation. As the disease evolves, the population of cells, which predominate remain immature, have decreased apoptosis and in many cases, upregulate anti-apoptotic genes and have deregulated proliferation as the number of blast cells increase. Etiological factors, which contribute to the development of leukemia, include therapeutic agents administered for a primary malignancy. The cytogenetic abnormalities, predisposition factors and genes involved in secondary leukemia will also be reviewed.